Or so it would seem if she took the time to meet and listen to her constituents, something she apparently sees very little need to do. Feinstein panders to her fringe constituents among the gay lesbian bisexual transgender community. In fact she remains their darling with her backing of President Obama’s decision to rescind the Defense of Marriage Act, (DOMA) which the majority of Californians disapproved and said so clearly in voting against Feinstein on Proposition 8. I learned noting from trying to save the delta smelt. In her arrogance she didn’t care about the commander’s in the field desire to keep “Don’t Ask, Don’t Tell” in place. 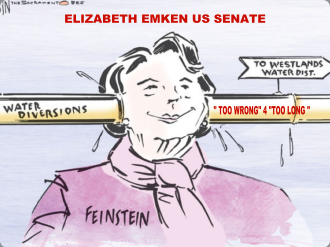 Feinstein wrongfully believes that C02 is associated with Climate Change as clearly evidence has been produced ad nausea showing the entire concept to be an entire fraud. 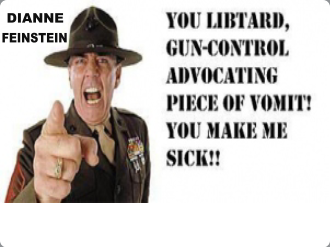 So completely out of touch she hasn’t a clue the “The Gunny has absolutely no use for her either. As she panders away she will like Obama, lose the votes of our men and women in uniform currently serving overseas and those who have recently done so. Too bad senator America’s bravest and finest enjoy their weapons. 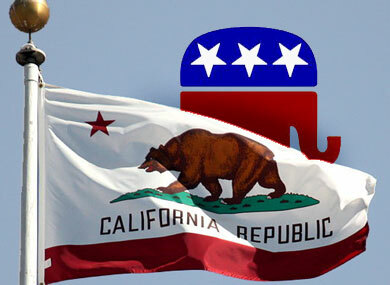 In contrast, yesterday evening, Elizabeth Emken with an aggressive voter outreach strategy by the California Republican Party discussed her positions while answering numerous question as the CA Republican Party’s endorsed candidate for the U.S. Senate. The event was co-hosted by Chairman Tom Del Beccaro and Mark Standriff, a political consultant to the party. This forum gave Elizabeth the chance to speak directly to thousands of Republican voters across the state. The event reached over 13,000 people who participate in the live forum. Elizabeth spoke candidly about a wide variety of issues, including jobs and the economy, health care, education, energy policy, and Dianne Feinstein’s failed political agenda. Chairman Del Beccaro shared the CRP’s position on a number of ballot issues, with special emphasis on the “Stop Special Interest Money” measure. The tele-townhall format provides a wide-scale platform for the candidate to share her vision to a stadium-sized crowd filled with likely voters, while at the same time giving the participants the intimate feeling of a one-on-one conversation with theElizabeth. It’s a remarkably effective campaign tool. Officially, 13,447 attendees took part in the tele-townhall last night. From the very start, Elizabeth has committed to connect directly and personally with as many voters as possible, whether through tele-townhalls, precinct walks, and social media. The reader may follow Elizabeth on Twitter at @Elizabeth Emken and @Emken2012 and like her Facebook page to keep track of campaign news and events.